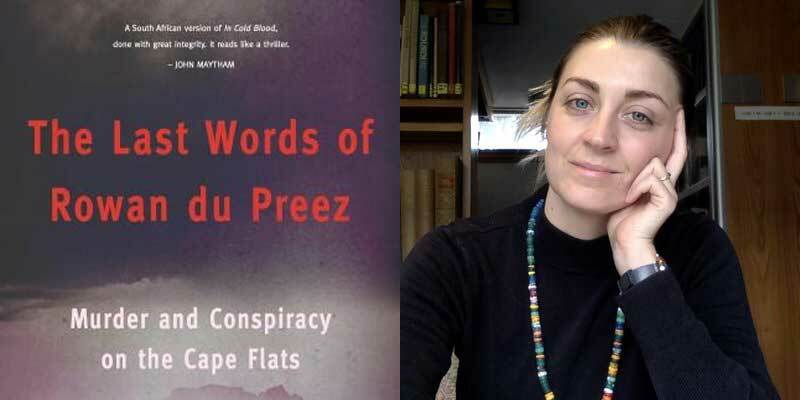 Simone Haysom’s The Last Words of Rowan Du Preez: Murder and conspiracy on the Cape Flats is set to make its debut at the London International Development Centre on October 11, 2018. The book was supported by the Miles Morland Writing Scholarship. The Miles Morland Writing Scholarship has established itself as one of the few initiatives that allow African writers to take time away from their jobs to write their books. It does this by giving actual cold hard cash to its scholars ensuring that they do not have to run around trying to pay bills for a year as they finish their manuscripts. Some of the recipients of the scholarship include Yewande Omotoso, Ndinda Kioko, Abdul Adan, Ayesha Harruna Attah, and Lidudumalingani Mqombothi. In 2012 Angy Peter was bringing up her young children with her husband in Bardale, Mfuleni on the Cape Flats. Angy was an activist, and spent her days collecting evidence for a commission of inquiry into policing that had the chance to change law enforcement across the country’s troubled townships. She was vocally against vigilante violence and a go-to person when demanding better services from the police. But when the commission started its hearings, Angy found herself on trial for murdering – necklacing – a young neighbourhood troublemaker, Rowan du Preez. The state’s case centred on the accusation Rowan had allegedly made with his dying breath – that Angy had set alight the tyre around his neck. Simone Haysom takes us into the heart of a mystery: was Angy Peter framed by the police for a murder she didn’t commit? Or was she a wolf in sheep’s clothing who won a young man’s trust and then turned on him in the most brutal way? Simone Haysom spent four years meticulously researching this case and the result is a court-room drama interwoven with expert opinion and research into crime and the state of policing in the townships of South Africa. The book will be presented in London with the author in conversation with Kim Chakanetsa of the BBC discussing the book and its themes. You can also get copies of the book on sale at the event. If you think that your writing is good enough you can still apply for this year’s Miles Morland Scholarship; you deadline is in four days on September 30. These are the stages that you potentially will be seen on if you get it. Good luck. Previous Previous post: Zambian poet and writer Luka Mwango has passed on. Next Next post: Muthoni wa Gichuru is CODE Burt Prize for African Young Adult Literature Kenya 2018 winner.